Fisheye lenses are extreme wide-angle lenses that have focal lengths between 6mm and 16mm, and give an incredible angle of view of 180 degrees on the diagonal! Consequently, fisheye lenses have all the advantages already mentioned for wide-angle lenses - only more so! Some give a full format rectangular image, others only a circular area in center frame. Fisheye lenses bend straight lines to a great extent, especially at the edges of the frame, but this is not a disadvantage in most underwater applications. 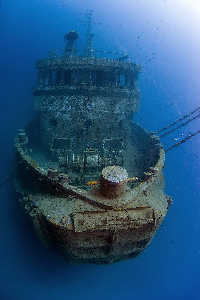 If you want to photograph wrecks seriously you must have a fisheye, which also means you must have a housed SLR. Because everything seems so small in the frame with Fisheye lenses they also make the visibility seem twice as good as it actually is! The downside with using fisheyes is that you have to be careful not to get your own fins in the shot! Dome shades are not much use with fisheye lenses because of Vignettingcropping of the corners of the frame. If unintentional it is due to a misaligned lens or port. !